This week's CAS-ual Fridays Challenge is to use hearts in summer colors. The inside of the card is lined with Amy Tangerine Cut & Paste paper. For the card base, I've used a journaling card from a 12x12 paper. 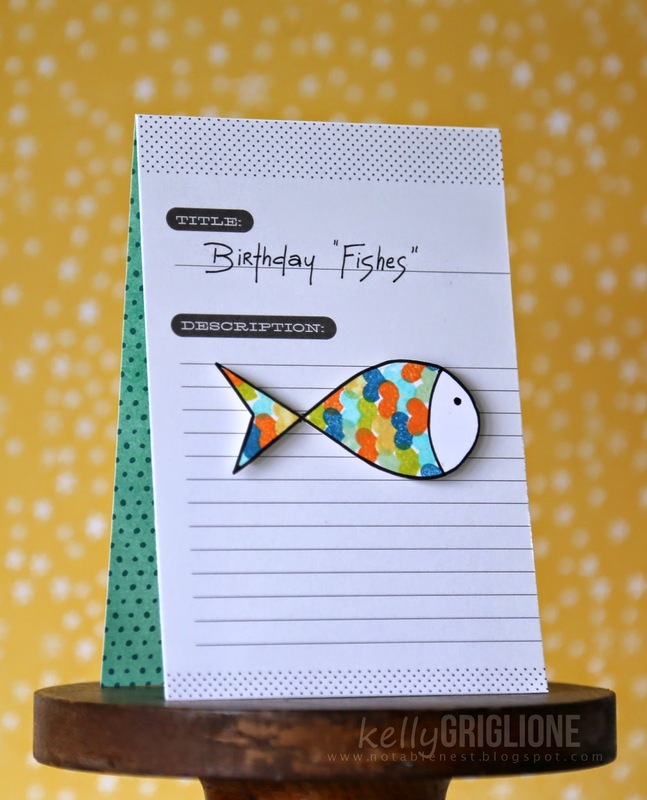 The "title" of Birthday Fishes is further "described" as, well, a FISH. And this is where the "hearts in summer colors" comes into play. 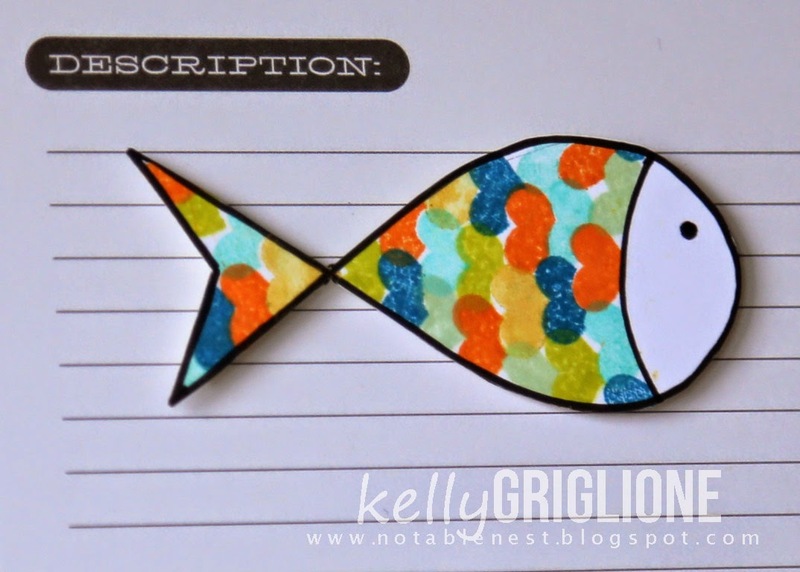 I've masked a small heart (from In the Cards) and used it to make little fishy scales. The fish itself is just drawn with a marker, grade school style. You can't take yourself too seriously, right? 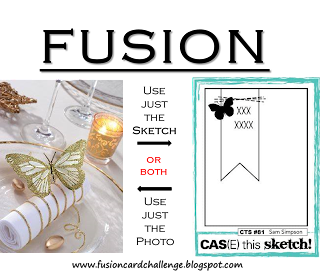 The winner of this challenge will get a fabulous prize from Simon Says Stamp and will also be featured as a Guest Designer for CAS-ual Fridays Stamps. Runners up will receive a stamp or die set of their choice from CAS-ual Fridays Stamps! Hi folks! 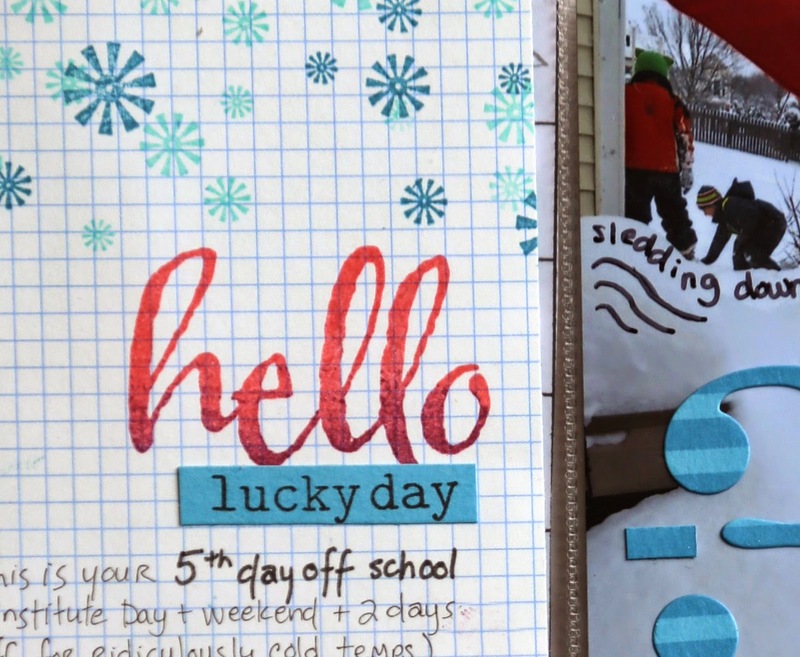 I'm sharing two Project Life pages on the Winnie & Walter blog today. 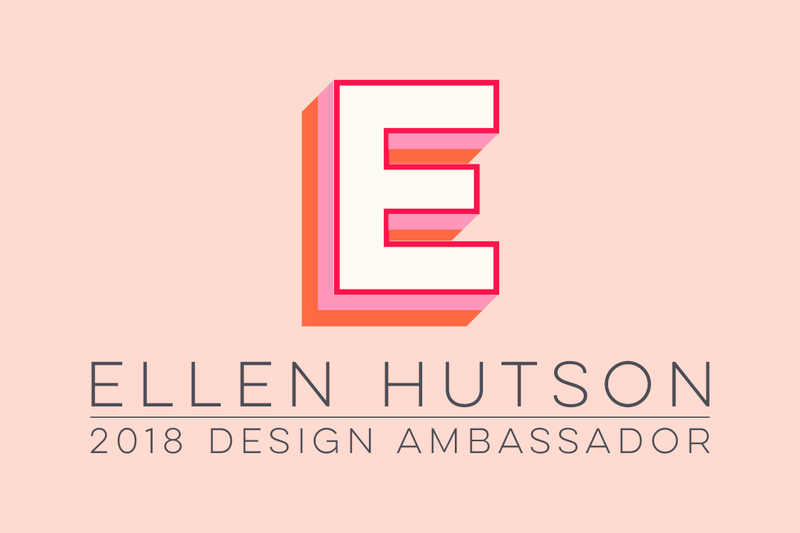 If you get a chance, stop by and check them out : ) I'm on a quest to finish this thing up before Jackson starts 1st grade! Hi Folks! Well, it's summer, the kiddos are out of school, and crafting time is at a premium around here. Luckily (?!?) 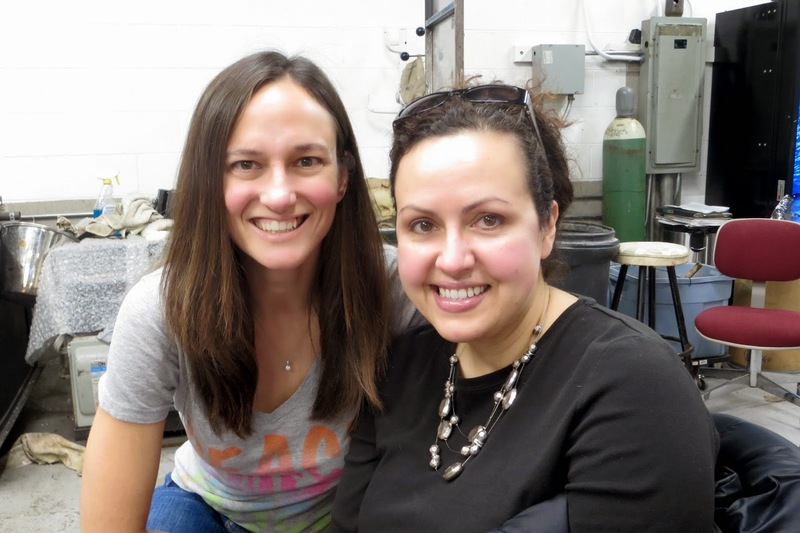 it was raining one day and I was able to have a ton of fun in my craft room. Here's one of those cards. The papers are from American Crafts (Dear Lizzy) 5th & Frolic line. 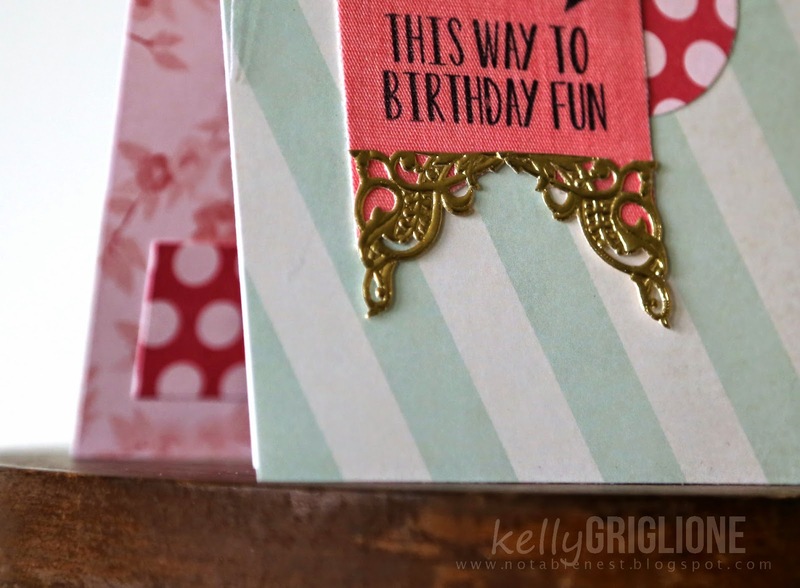 Since the Heart Board die makes 5 hearts at once, there's often a good opportunity to embellish the inside of the card (or your envelope) with any left-overs for a coordinated look. In this case, there were two hearts left over, so I used them to enhance the sentiment and to contain the closing signatures. This is a card that will get used right away (hooray!!) so I made a coordinating envelope while I had everything still out. I'm really liking making vertical envelopes recently (you pull a vertical card out on the folded side). It doesn't cost any more money or time, but it's just a little bit different. 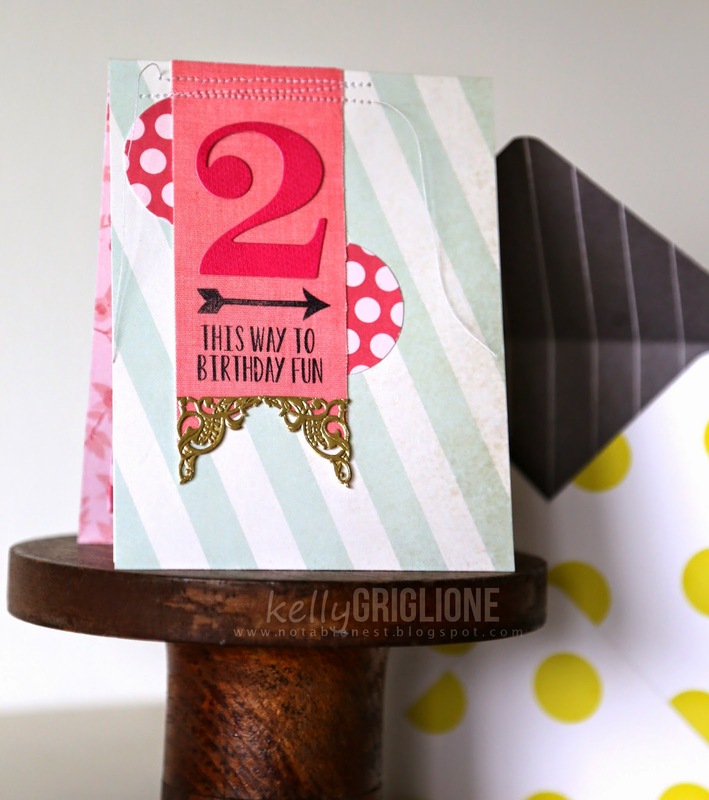 This card is over at the CAS-ual Fridays Stamps blog today. This time, there's a twist ... we're hooking up with CAS(e) this Sketch. 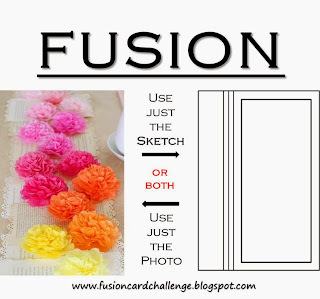 For this challenge you are welcome to link up with both challenges if you use the sketch or do a Fusion. With crafting time at a premium in the summer, I'm all about being efficient, so being able to hit two challenges at once is a definite plus. Don't delay, however, as this challenge will only last one week, ending Wednesday, June 25th at Noon (PST). We will be back with a new challenge in two weeks on July 3rd. 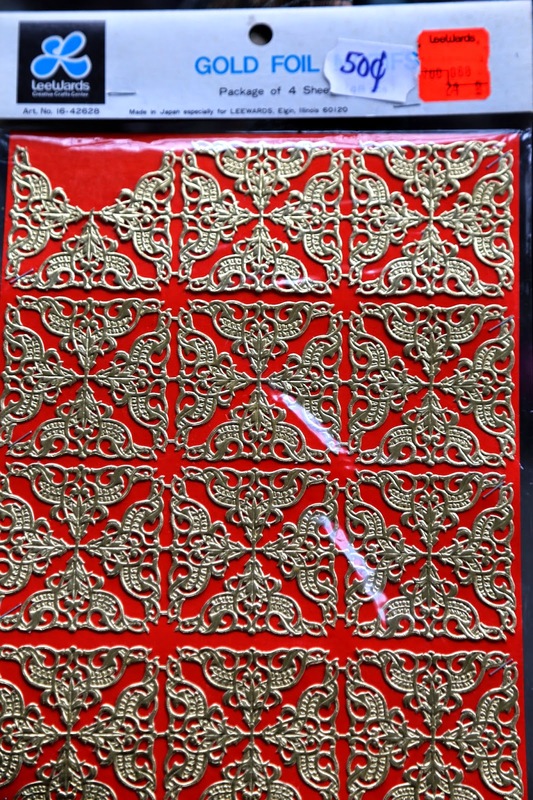 This card is a fusion of both the photo (using gold filigree) and sketch. I used American Crafts Cut 'n Paste patterned paper, and AC adhesive-backed fabric paper for the banner. The stamps are Avery Elle Aim High (won from the Stamping Royalty contest ... thanks Paper Crafts!) 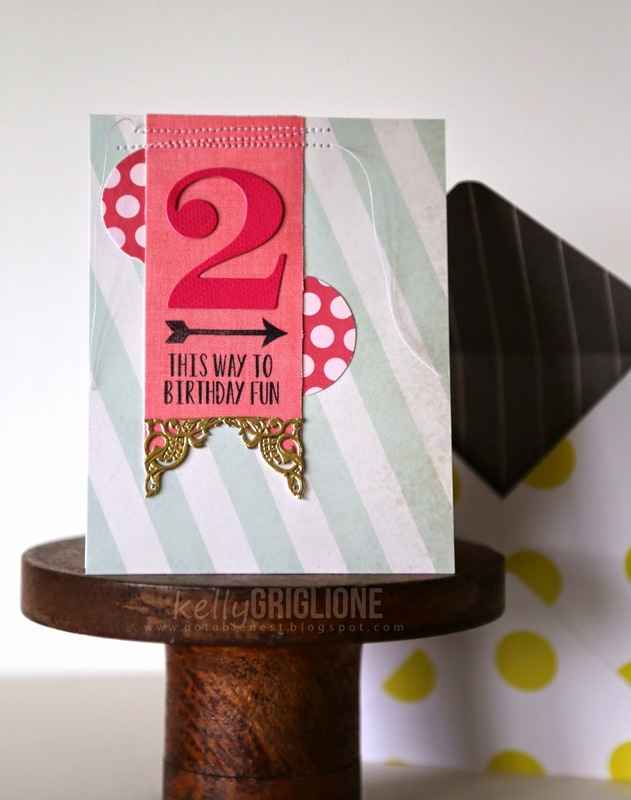 and the die cut number is from Papertrey Ink. 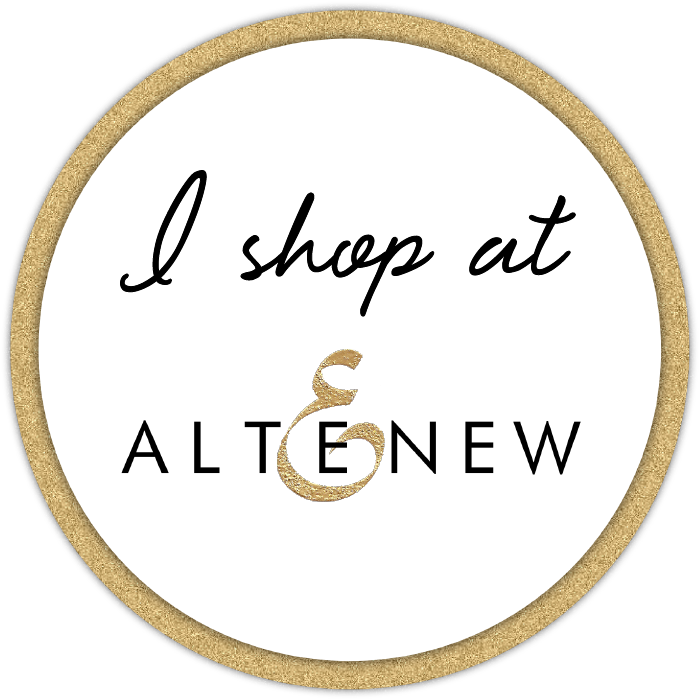 I could not pass up the opportunity to also play along with the NBUS (Never Before Used Schtuff) Challenge hosted by one of the best blogging friends that I'm sure you all know and love as much as I do, Darnell Knauss. She just reached 500 followers, and by the looks of it, will be hosting a 600 follower challenge any minute now! And BOY does this count as NBUS, as in, this has been around for FORTY YEARS and it hasn't been used yet. Does anyone remember LeeWards? Based on the font and price tag, I would guess this is from the early 1970's or maybe 1960s. You can see where I broke open the packaging, used one of them, and cut it down the middle. Love how they look on the end of the fabric banner. Here's the inside of the card that's going to our 2 year-old cousin. More 5th & Frolic papers, as well as Winnie & Walter stamps. 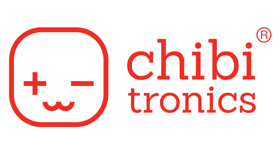 Hi folks, welcome to another fun Fusion Challenge! I am so in love with the color palette for this challenge that I didn't even think about using the sketch this time. I unrolled some white crepe paper and started spraying Heidi Swapp Color Shine Mists in the same order as the photo. After making running stitches down the center, I gathered the crepe paper and adhered it to the card base. There was way too much empty white space to the left of the sentiment so I filled it with some white stars (fills it, but doesn't compete with the crepe paper). The sentiment is a MFT Die-namics Accent It die. 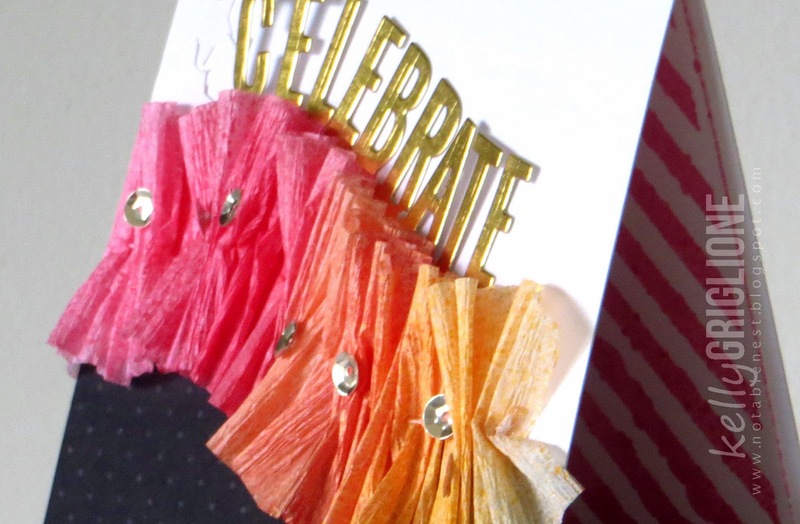 Vintage sequins are added to the ruffled crepe paper, and the inside is sprayed with more of the Heidi Swapp Color Shine over a Heidi Swapp stencil.